Bio toothpaste nourishes your teeth and gums in a natural way. The product contains ingredients from controlled organic cultivation that prevent caries, paradentoses and other oral cavity diseases. They refresh their breath, create a pleasant feeling and take care of the health of your teeth. 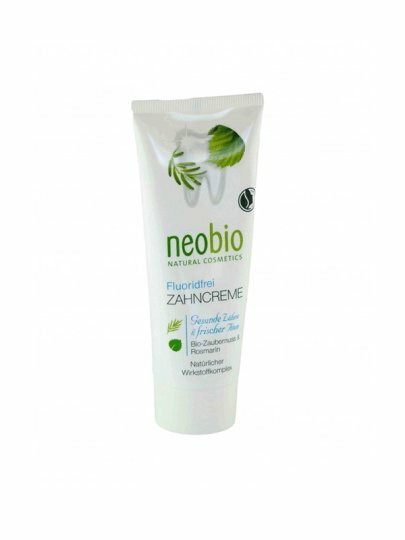 Bio toothpaste contains hamamelis and rosemary which are known for its healing properties. These valuable herbal extracts clean and nourish the teeth and dental flesh, while mineral beads reduce the appearance of dental calculus and plaque and prevent the formation of caries. The old belief is that the smell of rosemary stimulates the memory, which is today scientifically proven. Rosemary encourages circulation and the flow of blood to the brain, thus improving the concentration and treating the headache. Use it twice a day. Apply the toothpaste on the brush and brush it with the inside outwards for at least 2 minutes of circular movements by massage and gum.